We’re at home between trips, and it’s time to take care of our trusty steed, the silver Mercedes GL320 that has hauled us across the country and back at least seven times (plus many other trips). I learned many things when we were full-time travelers, and one of them was that you don’t skimp on vehicle maintenance. When you’re on the road, that car or truck is literally your lifeline. When the tow vehicle ain’t happy, ain’t nobody happy. So I tend to scrupulously maintain it and almost obsessively observe it (look, listen, sniff) for any hint of a problem brewing. The GL is coming up on a milestone: 100,000 miles, to be specific. This year in May the extended warranty expired too. This all means that the car is transitioning from being a highly reliable creampuff, to being subject to the quirks and complaints of middle age. Without the warranty I’m now less insulated from the financial hits of future repairs. This is exacerbated by the fact that the 97,600 miles on the odometer today are mostly the result of towing work—meaning that we’ve asked the car to do a lot more than the average commuter. So when I brought it to the dealer this week for a routine service interval, I asked them to check out a few specific things. There was “no cause found” for the strange power loss we experienced last week, but a software update was indicated which may alleviate the issue. I’m not really terribly optimistic about that, because the car has had many such updates and not one of them has ever solved a problem. This is usually the first step in a series of “let’s try this and see if it helps” solutions. But in the careful inspection the dealership did turn up a few things which are typical for a car of this mileage and use. One of the rear shock absorbers is leaking. They should be replaced in pairs, so that’s really two rather expensive shocks. One of the bushings in the right lower control arm (a front suspension part) is cracked and nearly worn out. The engine mounts, which on a Mercedes are filled with hydraulic fluid, have begun to leak and so they must be replaced too. And the battery is coming due for replacement. The dealer of course uses Mercedes OEM parts and charges full retail for them, plus fixed labor rates, so the estimate for all of the above (except the battery) was a whopping $3,800. I will not be paying that amount. I will use Mercedes parts despite their rather high cost, because my experience has been consistently that they function better, fit better, and last longer than most of the aftermarket options. As a car reviewer once wrote, this is because “Mercedes parts have been dipped in gold and polished by trained unicorns.” But I will buy them through online parts stores at a discount and have my friendly neighborhood independent mechanic install them. This will make the bill about $1,700—still far from cheap, but within the budget I’ve set for annual maintenance. So far this year the car has consumed about $1800 in other repairs. The air conditioner compressor, which has been intermittently failing to cool for the past five years, finally failed sufficiently that we could diagnose the fault. We replaced that in July. The blower motor shorted out the month before, which caused it to keep running even when the car was off, and so that got swapped out too. Annoying, yes, but not unexpected. When I bought the car I had a plan to get it paid off before the warranty expired, because that’s when it could be expected to start getting expensive in repairs. When the loan was paid, I immediately re-allocated the money that had been going to the car payment, to a savings account for future repairs. So at this point despite the expensive repairs, we’re still ahead financially (compared to a new car payment) and I expect that to continue to be the case for several years. When the equation shifts the other way, or when Tesla makes an electric car that can pull my Airstream at least 250 miles on a charge, it will be time to leave the old steed behind. That’s not anytime soon, I think. I like the GL better than the Nissan Armada we had before, even though it’s less roomy and costs more. It took me five years and 97,000 miles to come to this conclusion, but at last I can say, “Yes, I recommend the GL as an Airstream tow vehicle” —as long as you actually maintain it. It has proven to be a very capable tow vehicle. And it’s really fun to have people asking us “Does that little car tow that big trailer alright?” every few days. So we’ll keep it as long as it makes sense. This was a pretty good trip west, considering that we were covering a familiar route and thus were susceptible to the malaise of “the road too often traveled.”* Our experiments with alternate routes ended up much like you’d expect: some successes, some failures. On the positive side, we found some very nice roads through Kansas (and more through Missouri and Arkansas that we’ll try next year), lots of historic sites, several new state parks, and amazing scenery through New Mexico. To the negative side, our cadence through the trip was off. Normally on a rush-rush trip (and two weeks to go from Vermont to Arizona is definitely a rush in our book), we’ll travel 350-400 miles for a day or two, then take a couple of days off to browse an area and recuperate from sitting in the car. This time we tried a different routine of exploring in the morning, then driving 200-300 miles to another interesting spot for the night so that we can explore it again the next morning. It was efficient but too grueling, and after a week of this I was burning out. So we’ve decided to go back to the previous method, at least when we don’t have time to do it a more relaxed way. Still, we managed to do a lot of the things we like. 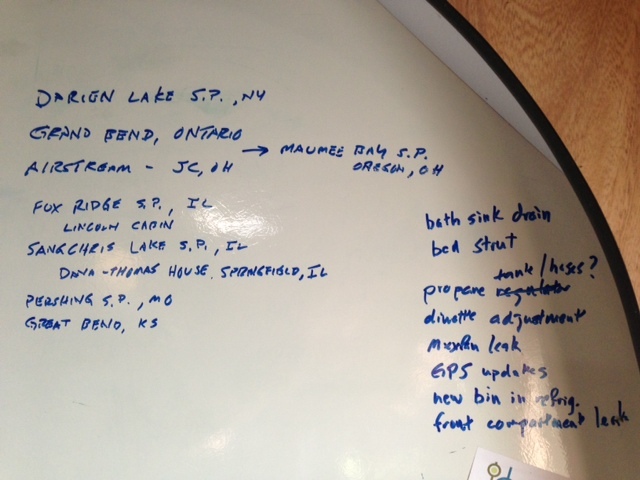 I keep a trip tally of places visited and anticipated, on our white board in the Airstream. This trip we hit seven state parks: Darien Lake (NY), Maumee Bay (OH), Fox Ridge (IL), Sangchris Lake (IL), Pershing (MO), John Martin Reservoir (CO), Fool Hollow Lake (AZ), plus one Canadian Provincial park (Pinery in Ontario). That’s a win right there, because the camping experience in every one of those parks was nicer than almost any of the commercial parks we’ve ever visited. The state parks may have gotten more expensive since the Great Recession, but they are still a bargain if you like being out in the country. During the trip we managed to add to our list of national park sites, which is getting harder these days since we’ve visited nearly a third of the entire NP system. Kansas may not have a leading reputation as a tourist state but we certainly enjoyed Brown v Board of Education National Historic Site and Ft Larned NHS, and Bent’s Old Fort NHS in Colorado, and Apache Ruins Nat’l Monument in New Mexico. Anyone who is going to the WBCCI International Rally next June in Farmington NM should plan a half day at Apache Ruins, as well as a full day at Mesa Verde National Park. Emma picked up a Junior Ranger badge at Apache Ruins. She didn’t have time to complete the programs at the other sites, which was another symptom that the cadence of the trip wasn’t right for us. By the time we got to New Mexico I had recognized the mistake and we started to slow down a little, taking three days to get through New Mexico along Rt 64 (spectacular) and Arizona. That means stopping and checking out things by the roadside like the Rio Grande Gorge Bridge, a picnic stop at 10,500 feet on Rt 64, views in the Salt River Canyon in Arizona (Rt 60/77), etc. Can you see our Airstream parked along the roadside in the photo below (way at the back)? Our last stop was Fool Hollow Lake State Park in Show Low, AZ. It’s very popular and for good reasons; the sites are beautiful. We only go on weekdays because there’s no chance of getting a walk-up site on a weekend. 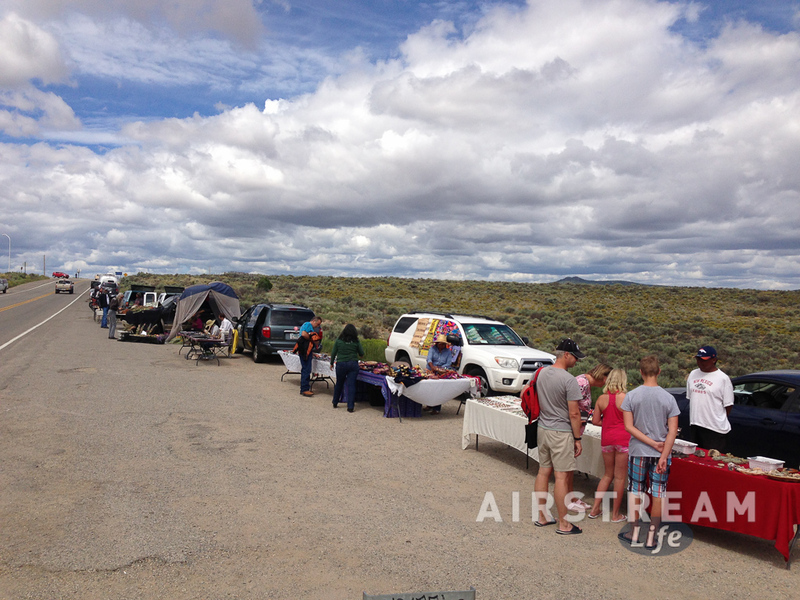 This time we ended up in the midst of what appeared to be an Airstream gathering. To our left were two Airstreams parked together (a few tandem sites exist at Fool Hollow), to our right was a 1970s-era Argosy, and further down the loop we spotted two more late model Airstreams. It’s unusual to see this many clustered together, but it was just happenstance. Our neighbors to the left were playing classic 78-RPM records on a portable Victor record player, and told us they were planning to come to Alumafiesta in Tucson next January. I mentioned in the previous blog that the GL was due for maintenance. It did a strange thing to us while climbing out of the Salt River Canyon area in Arizona. The computer decided to limit engine power for no apparent reason. It will do this if the transmission or engine temperature get high, but that wasn’t happening, and in any case it should restore full engine power when things cool off. This time it stayed at low power, which meant even on a flat road I couldn’t get past 48 MPH and it took forever to get there. Even stranger, we didn’t get any sort of malfunction indicator. This car has something like 48 separate computers and dozens of sensors that measure absolutely everything, so even something small will set off dire warnings on the instrument cluster. This time, all seemed normal except for having no power. We were not going to be able to get home like that, at least not while towing a trailer up hills, so I called the dealership for advice. They suggested just turning the car off and then on again–essentially, rebooting it. This worked and the problem hasn’t recurred since. Perhaps the GL was feeling a touch of “road malaise” too? Still, I’m glad it is going in this week for a major maintenance interval so they can review any stored malfunction codes. At 97,000 miles the car is at an age where a few problems can be expected, but my standard is 100% reliability while on the road, so if anything seems amiss it will get fixed now. 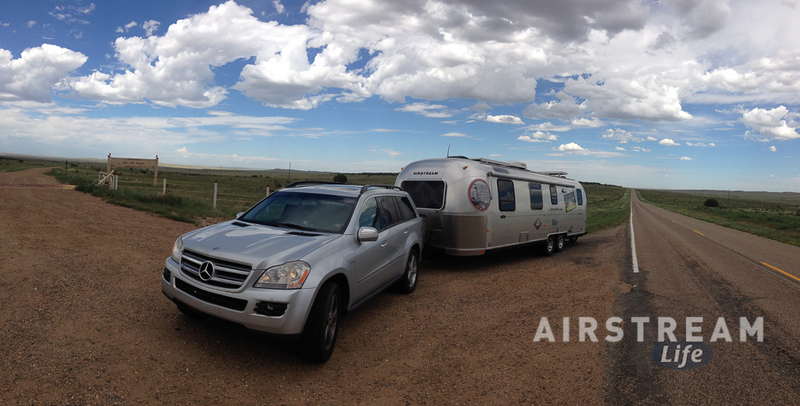 Now that we are home, it’s time to unload the Airstream and get it ready for the next trip. We were drastically over-packed this year and the only solution is to get everything out and review what we are carrying. It’s really inefficient when you’ve got to move six items to get to the one you need. Any trips we do this winter will be more local, so we should be able to travel much lighter—without motorcycle gear, tenting gear, sewing machine, Wii, food for weeks, clothes for three seasons, homeschooling supplies, Aluma-event gear and costumes, etc. This Saturday I am taking off (by airplane) to Oregon to attend Alumafandango. It would be nice to have the Airstream but I would be risking another case of road malaise if I tried to tow it 1,200 miles up and back in September. It doesn’t matter; I’ll be surrounded by aluminum all week anyway, thanks to the new trailer display by George M Sutton RV and the 85 or so Airstreams registered to attend. I’m looking forward to that! After writing the previous blog extolling the virtues of slower travel through the Plains states, I felt obliged to get off I-70 as soon as feasible and explore other routes through Kansas. We dropped south to parallel routes and spent our evening in Great Bend, KS, a small town that we chose only because it was about the time of day that we wanted to stop traveling. When you are moving around the way we are, it’s hard to be fussy about where you stay. We are always prepared to boondock a night or two in a parking lot or driveway, and it’s actually a good way to cut down the cost of travel. Long-time blog readers know we rarely make reservations, and this is part of the reason why: we often don’t know exactly where we are going to be tomorrow. In this case the decision to stop in Great Bend was made about an hour before actually getting there. 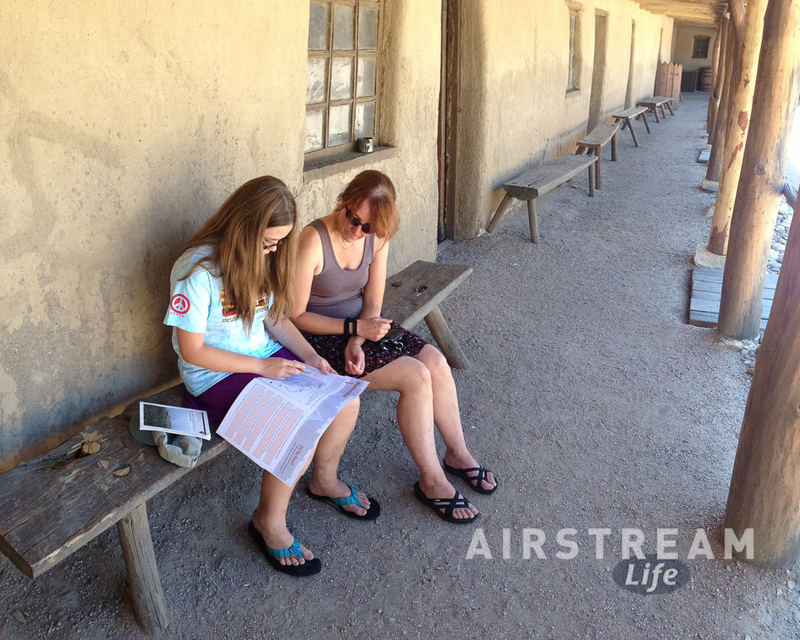 I use an app called “Allstays Camp & RV” to look ahead for possible campsites each day. (Apps like this are basically the modern equivalent of the old Woodall’s and Trailer Life paper directories—but far more useful.) 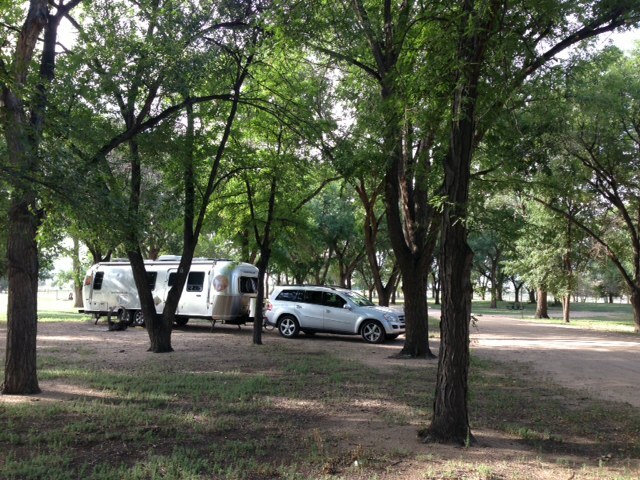 In this case we could see that Great Bend had a few small campgrounds that were all exceptionally cheap, running about $10-15 for a full hookup. At that price you have to expect that the campground will be basically a parking lot with no amenities at all, and that’s fine with us. For an overnight stop, we don’t need a shower house (we have our own) and certainly not a trout pond. Thus, we have gone from Grand Bend, ON to Great Bend, KS, in a little over a week. This reminded me of June, when I went from Perce Rock on the north Atlantic coast off Gaspé, to Morro Rock on the Pacific coast off California. This has been a summer of almost too much travel. I’ve really enjoyed it. Yesterday I tweeted a photo of our unimpressive campsite on a mud & gravel parking lot. I forgot that these days there’s always someone monitoring … and so I heard back from fellow tweeter @GreatBendKS with a comment that next time we should get in touch and they’ll direct us to a nice place at a similar price. This sort of thing has happened before, both on positive and negative comments I’ve made about campgrounds. In one case an armed ranger came to our campsite to say “Thanks for the nice review,” and in another case a campground owner threatened to sue me. Luckily, people in Kansas are friendly. I thought our visit at Ft Larned National Historic Site would be quick but it turned into a multi-hour saga. Emma got another Junior Ranger badge (I think she’s earned over 70 of them at this point) and we had lunch. It was tortuously hot, running 103-105 degrees, which made a mockery of my earlier decision to skip I-44 down to Oklahoma in favor of “cooler weather” heading toward Colorado. But Ft Larned was interesting and well worth the stop. With the last few days running progressively hotter, we’ve spent every night in a state park or commercial campground just for the electric hookup to run the air conditioer. I don’t mind that because the state parks have all been great. Last night’s stop was perhaps the best of a great bunch: John Martin Reservoir State Park in the town of Hasty, CO. It has both sunny sites by the dam and shady sites beneath mature trees, and at least during this week it is mostly empty, which I love. Now that we are slowly climbing the plateau, we’re up to about 3,300 ft elevation and the nights are running cooler even if the days are still pretty hot. A note about maintenance: I’m reminded once again that this sort of rapid travel across the country does come with a price. We have logged nearly 8,000 miles so far this summer (since leaving Arizona in May), which is about average for us. In the past two weeks we’ve done routine and minor maintenance such as greasing the Hensley hitch, adding DEF to the car (a diesel thing), and disassembling the bathroom sink plumbing to clear a clog. But when we get home we’ll need to tackle the “bug list” that has been accumulating on the white board. The GL320 is due for some love. The car is now at 97,000 miles and due for an oil change, transmission fluid change (we do it about every 30k miles), and a new set of tires fairly soon. I don’t mind because the GL has been pretty good to us and looks good to go for many more miles. And I still get the question almost every week we travel: “Does that little car pull that trailer OK?” Watching people gape at our 30-foot trailer and “little” SUV can be pretty entertaining, especially at the fuel pump. 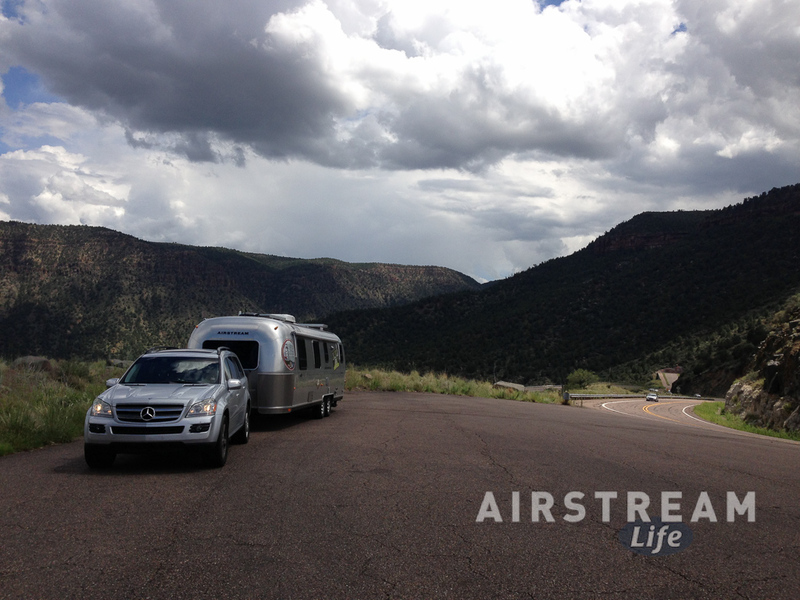 The Airstream also needs a few tweaks. The rainstorms we’ve been driving through have revealed two leaks. The MaxxFan in the front bedroom seems to have a small, wind-driven rain leak. That’s probably just a matter of re-caulking a spot, so I can do that easily once I get a chance to get on the roof. The bigger problem is the front storage compartment, which has always leaked but really flooded in the last storm. We’ve had it “repaired” twice and nobody has ever been able to really get it to be totally waterproof. 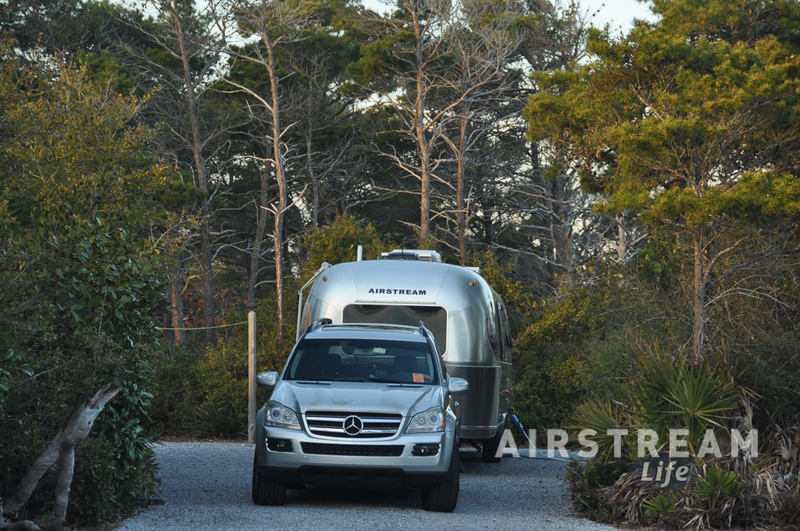 It is also difficult to open and close when the Airstream is hitched up, because the body of an Airstream is flexible, and the flexing causes the door to jam. I have concluded after years of hassling with it that the only solution is to replace the compartment door with the updated design, which has rounded corners instead of square. This job will be major surgery that gets a little beyond my personal comfort zone, so I may recruit the help of one of my more experienced Airstream friends this winter. In the meantime, since we may encounter rainstorms again today, we’ll seal the compartment with packing tape, as we used to do years ago when we were full-timing. It’s a kludgy solution but it will do until we get home. We’re only a little over 800 miles away from wrapping up this trip. In reality, we didn’t give up much at all. 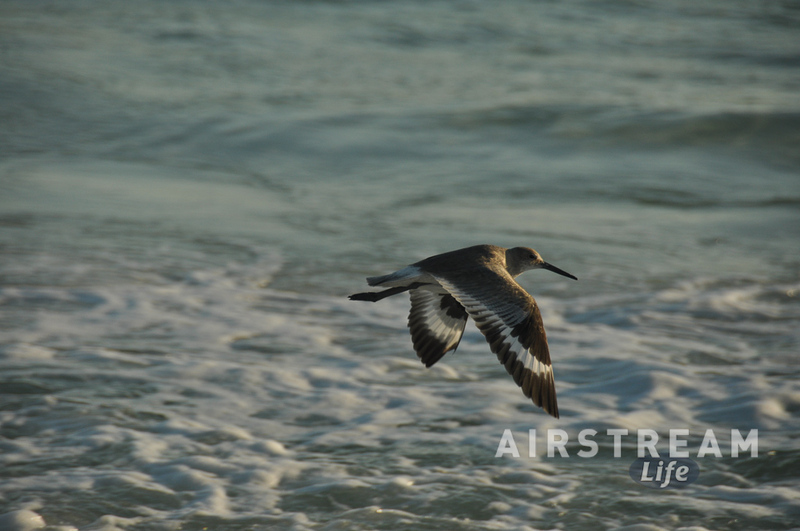 I was able to grow Airstream Life slowly while we were traveling, and we had all the possessions we needed (and gained a new understanding of what’s really important), we discovered an entirely new traveling community, and we felt just as as secure in our Airstream as in any home we’ve ever owned. Few people who hadn’t tried the lifestyle would believe that. However, there was one painful truth. When the business got to a certain point, it became less convenient for me to be traveling around full-time, and I found much greater productivity when I was able to stay home and sit at a desk with reliable high-speed Internet. I’m not saying that I couldn’t continue to travel, but once placed at home, things sort of blossomed, work-wise. Now, five and a half years after we stopped full-timing, I find that I’ve managed to fill in all those hours that I formerly spent towing the Airstream and exploring national parks, and suddenly the work has taken over. It all came to a head on this trip, as I was trying to tow the Airstream east from Tucson to Sarasota, then run a week-long event, and then tow back to Tucson. There just wasn’t enough time in each day to take care of everything and it was getting frustrating to try. So after Alumaflamingo, we stopped to take stock of everything. We dropped out of sight for a days, Internet- and phone-free, and spent some time in the driveway of our friends Bill & Wendimere. 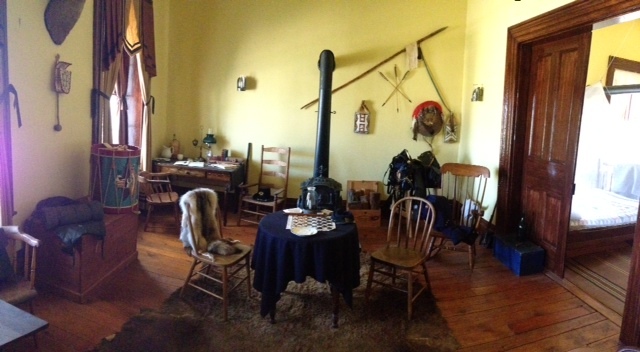 Think of it as a sort of personal retreat. Time to contemplate toes and get a fresh perspective. The outcome is that, given all considerations, we should lean back a little toward lifestyle over money. For one thing, that means bringing on more staff to do things that I (and Brett) have been doing for both Airstream Life and R&B Events. It also means looking at everything else we do as a business and as a family, to decide what needs to be pared down so that we can start traveling with less pressure and more spontaneity. These choices aren’t easy. It’s very much like moving out of a large house and into an Airstream: you have to be decisive and committed to the path or you’ll fail. In the case of downsizing one’s possessions (which we’ve done once before), success is indicated by the amount of “stuff” you stick in storage. If you put a lot of stuff in storage, you haven’t really pared down, you’ve just postponed the decision till later. It’s the same with lifestyle choices. If I offload work but continue to micromanage, I’ll be reminded of the folly of that strategy next year when a lengthy trip is interrupted and made stressful by numerous problems from the office. It will all work out in the long run, but I also know that none of this can take effect soon enough to help me on the drive home. It’s over 2,000 miles back to home and my “to do” list is embarrassingly lengthy. My goal is to be closer to the footloose mode of travel by next year, albeit perhaps a little bit poorer financially. It’s worth it. For the return run to Tucson there wasn’t much to do but to put on a smile and drive like a lunatic. The longer we take to get home, the more work piles up. The quicker I get home, the sooner I can start training people to do jobs that lighten my load. So while we aren’t going to get home quite as fast as we left for “Aluma-Zooma” we are going to be back no later than March 16. Let’s see … what have we done so far? Wednesday March 5, we left the driveway near Kissimmee and headed toward the panhandle. 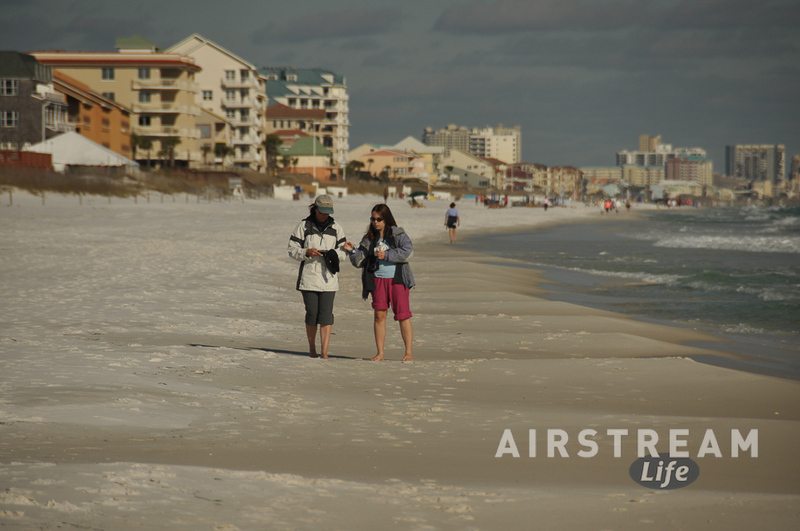 After an uninteresting roadside stop overnight, we pulled into Henderson Beach State Park in Destin, FL and had a couple of days at the beach. We watched the seabirds and walked the white sandy beach. This visit set a pace that I liked: two days of zoom, two days of chill. So we headed to Austin, TX next. Despite the fact that South by Southwest is going this week, we managed to snag two nights at Pecan Grove (near the epicenter of SXSW). I had a meeting downtown on Sunday night, which turned out to be an adventure in itself thanks to the colorful array of humanity attending SXSW, and another meeting on Monday at a barbecue place. To me, that’s a double-dip because Texas barbecue is pretty good stuff. We logged a lot more miles on this trip than I had anticipated, so I also spent half of Monday at the local Benz dealership getting routine service done. Good thing the dealers all have fast wifi—it was just as productive a morning as I would have gotten at home, with the added benefit of free pastries and a comfy couch. The GL320, by the way, has 87,000 miles on it now. Today, Tuesday, we started the trek across west Texas. There isn’t much to be said for the run along I-10 after Fredericksburg, so we made a point of stopping for lunch in Fredericksburg at one of the German restaurants, as a sort of last hurrah before plunging into the nothingness. Fredericksburg was a mob scene, as all the state parks are, because this week is also Spring Break in Texas. We had plans to hit a bunch of state parks on the way home, but that plan got quashed when we tried to camp at South Lllano River tonight and were told “all full”. Ah well, sometimes the footloose life isn’t easy. May we live in interesting times. Hmm.. another long absence from the blog. I can only plead guilty. Life has interfered with blogging in so many ways I can’t begin to count. But here’s a synopsis of what’s been going on. The virus I mentioned earlier dogged me right through the week when I was supposed to be getting ready for Alumafandango, and then into the event itself. The Saturday prior to the event I dragged my pathetic self out of bed, drove to Phoenix, caught a plane to Portland, and then rode four hours with Brett down to Canyonville to do pre-event work. Sadly, I was in no shape to do any of those things, and so upon arriving at the hotel I collapsed into bed and proceeded to be fairly useless all weekend. Brett did the heavy lifting, demonstrating once again that we could only do this as a partnership. Where were we? Ah yes, Alumafandango. 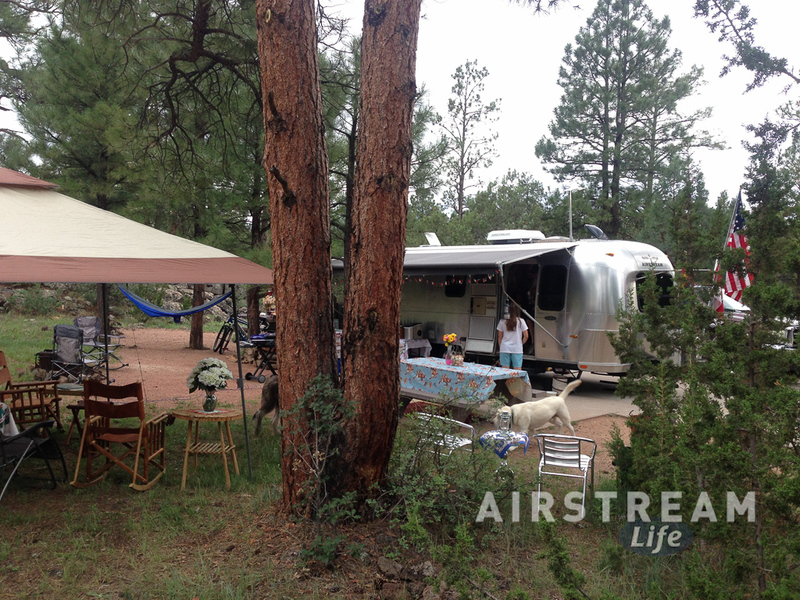 We had about 65 Airstreams on site, and people just raved about everything: the campground, the seminars, the activities, entertainment, meals … Even the wildfires in the area were blowing away from us, so we had virtually no smoke. The weather was great except toward the end where we had some pretty exciting thunderstorms. Three awnings were damaged in the first round of storms, which the Sutton guys fixed on the spot using parts scavenged from their new display Airstreams. After that everyone knew to pull in the their awnings when they were away. Brett and I ran a seminar in which we accepted written questions on any subject related to Airstreaming, which we called “Airstreaming for Newbies” but really got into some advanced topics. Nobody stumped us, and I got a few good ideas of topics to cover in the upcoming Maintenance book, from the questions people asked. We will definitely do that one again sometime in the future. The highlights of the week were many: Randy Grubb’s “Decopod,” Antsy McClain & Edgar Cruz performing on stage, the frankly awesome seminars by Thom the service manager at George M Sutton RV, the Saturday night banquet, the on-site wine tasting and off-site winery tour, several really fun Happy Hours, Indian drumming … I knew we had a hit when people kept smiling at us and saying things like, “Wow, it just keeps going!” About 1/3 of our attendees told us they were already planning to come again in 2014, and we haven’t even announced where or when we’re doing it again! Now I’m back in Tucson, picking up where I left off two weeks ago, and thinking about what’s coming up. There’s a lot of work ahead. Our event planning team (Brett, me, Alice) is already working on the programs for our February 2014 events: Alumafiesta in Tucson and Alumaflamingo in Sarasota. We want to have the tentative programs released in October. Alumaflamingo already has 100 trailers signed up, so it looks like it will be a big one and we want to respond to that vote of confidence with a truly amazing program of activities. It’s pressure, but the good kind. I’ve also got to get the Winter 2013 issue in some sort of shape for publication this month, even though it’s not due to layout until later. It’s looking like a good issue but there’s about 20 hours of editing work ahead. And lately I’ve been consulting to the organizers of Tucson’s new Modernism Week event (now in its second year) on how to put together a vintage trailer show this year. They are trying to get about ten nice vintage rigs for their show in the first week of October this year. I may do a presentation there on the history of vintage trailers as well, if they need it. It will be a great event to attend, in any case, with lots of architectural tours. Back in Vermont, Eleanor has managed some repairs to the trusty Mercedes GL320. It had some minor body damage from two separate incidents (one dating back a couple of years), and we finally took it to the body shop to get all of that cleaned up. Little dings can add up: the insurance claim was over $3,000 thanks to a ridiculously expensive front bumper part. It’s the sort of stuff that could be—and was—easily ignored but I hate to see it accumulate and make the car look junky before its time. The GL has about 74,000 miles on it so far, mostly towing, and I certainly intend to keep it for a few more years, so it was time to bite the bullet and pay the deductible to keep the car looking good. In two weeks I need to head back to Vermont and then set out with the Airstream (and once again, E&E) on our voyage west. We don’t have the slightest plan yet what route we are taking. All we know is that we need to be back in Tucson by Oct 1, which gives us about a month to travel roughly 2,500-3,000 miles (depending on route). I’m looking for little things along the way to fill up our itinerary so we won’t go too fast. This is a nice problem to have, after last year’s mad dash over the concrete Interstates. Slow travel is the best. It won’t be a vacation, but at least it will be an opportunity to take in some fresh new scenery in the Airstream before we settle back into home base for the winter. And there will be plenty to blog about!